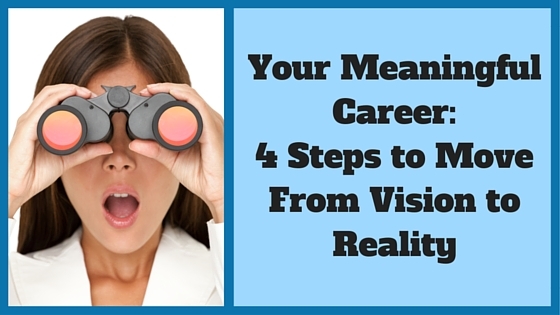 Are you craving more meaning and fulfillment in your career? If so, you’re hardly alone. Research shows that having a sense of satisfaction and purpose on the job has a demonstrated impact on our overall well-being. It makes us happier, healthier and more engaged at work and at home. The good news is that there are many ways to cultivate a feeling of purpose in your work and a career coach can guide you in exploring them and creating a plan to achieve the results you desire. Unfortunately, many of us jump into a job search too soon. We don’t do the groundwork to explore exactly what it is about the job that will give us what we truly crave. Follow these four steps instead and you’ll be well on your way to developing a work life that feels inspiring and motivating. One of the most common pitfalls on the path to developing a more meaningful career is not clearly defining what having a meaningful career actually means for you. Do you equate mission-based not-for-profit work with a meaningful career? Do you want to develop technology that changes how we do business? Do you love the satisfaction of smooth orchestration behind the scenes? After all, what feels meaningful to one person can easily be another person’s “soul-sucking” job. Do you view your work as a job, a career or a calling? Which activities or responsibilities do you truly enjoy taking on? What kind of environment produces your best work? Is there a specific contribution or impact you long to make? What’s the “bigger picture” of the work you do? Once you’ve narrowed down the qualities, responsibilities and activities that make work fulfilling for you, it’s time to expand your thinking. Your most satisfying work might come in a very different package than you’ve previously been expecting. The answer may be a change in industry, role, job activities or even a change in how you view the job you have now. This is the time to throw off the preconceptions of what you’ve done before or what the next expected career step might be and give yourself permission to want what you want. For example, I often encourage clients to consider ideas they’ve never considered before and give themselves permission to follow what interests them. Give yourself options; you’ll have plenty of time to narrow them down later. If you could design your perfect job, what would it look like? How might you adjust the job you have to be more satisfying? Which new industries or companies offer what you’re looking for? Is crafting a new job or business a viable option? Often, when we start a job search or career exploration, we focus on how to repackage what we did before into transferable skills. While transferable skills are a great place to start, your toolkit of career resources is much, much deeper than the skill set you used at your last job—or even in the last 10 years of your career. Today’s ever-changing work environment demands—and often rewards—a fuller view of WHO we are, not just WHAT we do. What qualities do managers, colleagues or friends notice in you? What are your top strengths? How might you use them differently? Which roles and hobbies have you enjoyed outside of your job? Which topics are you most knowledgeable or passionate about? Who do you work best with, and in what kinds of roles? Now that you have a strong idea of where you’d like to go, it’s finally time to take action with a clear, well-thought out plan. Your willingness to take a step back and take stock of where you’ve been, get clear on what you want instead and identify what you bring to the table makes it easier to confidently evaluate options. Instead of running after any potential opportunity that comes up, you’re narrowing down to a direction and a career goal that is grounded in who you are and your bigger vision for your work and your life. With your vision in mind, what’s the biggest win you can go after first? What steps will you need to take to get there? Who in your network can you ask for help? What’s your next immediate step? Work isn’t meant to be a four-letter word, far from it. You can have a career that incorporates passion, happiness, meaning and belonging. Your work can be an opportunity to share skills, talents and knowledge in a way that fills you up, while creating the impact and income you desire. And with exploration, imagination and consistent action, your vision of meaningful work can be well on its way to reality. Thinking of hiring a career coach to help you make a meaningful career transition? Connect with Sally, browse our directory of career coaches and get a FREE consultation or request a personalized coach recommendation! Sally Anne Carroll is a life/career coach for professionals and entrepreneurs who want to re-tool their work, define success on their own terms and design healthy, balanced lifestyles that match their strengths and priorities. She’s a freedom-focused advocate for helping clients reimagine, redefine and reinvent the status quo to achieve their personal vision of success and fulfillment. Sally splits her time between Portland, Oregon, and Christchurch, New Zealand. Visit her website to learn more and connect.